Loadstar Sensors provides easy to use software for load cells and other sensors that can operate under all versions of Windows (Windows XP through WIndows 10) running on a PC, Mac or Tablet. We offer a variety of software versions which should meet most of your common needs for displaying, logging or plotting sensor information easily on a PC. When your application needs customization or features that are not present in any of these standard versions, we will be happy to customize it for you for a nominal cost. Please contact us for additional information or help! This basic software connects to our iLoad Series load cells or any resistive load cell connected to a DI-100/DI-1000 interface and displays the value of the force, load or weight. You can zero out initial load (Tare) to display net weights taking out any initial values. You can also change units to display the values in grams, kilograms, Newtons, pounds or oz. This software is included with all purchased load cells and the install disc contains all the drivers needed to install and run our load cells. This basic software connects to up to four of our iLoad Series load cells or any resistive load cell connected to a DI-100/DI-1000 interface and displays the value of the force, load or weight and total weight. 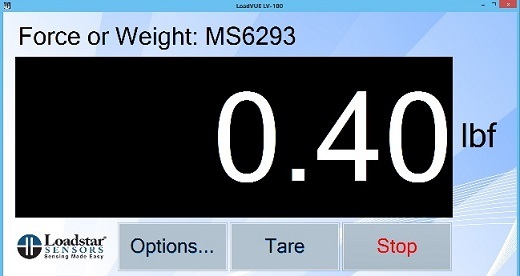 You can zero out initial load (Tare) to display net weights taking out any initial values. You can also change units to display the values in grams, kilograms, Newtons, pounds or oz. This software allows a user to not only display the load/force/weight information on a PC, it also allows a user to log the data to a comma separated Excel friendly file and to plot the Force vs. Time data as a X-Y Plot. 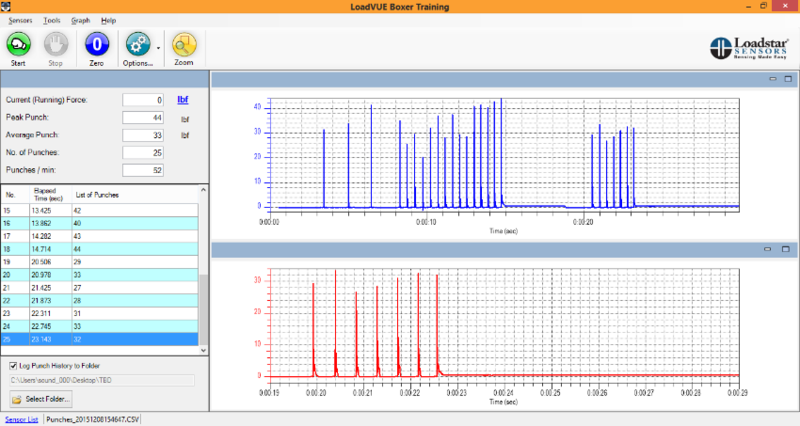 The software also indicates the Peak/Low values during a test. The user can select if he/she wants the plot to be a cumulative graph for the duration of the test or a strip-chart that shows the latest data in a defined time interval. In addition, the user can set the time intervals at which he wants the data to be logged and can set limits beyond which the software sends out alerts either via email, SMS or as an audible alarm. LV-1000 can handle up to 150 data samples per second. If you need to handle data rates up to 500 samples per second, then we offer LV-1000HS. For data rates greater than 1000 samples/sec, please see LV-1000HS-1K below. 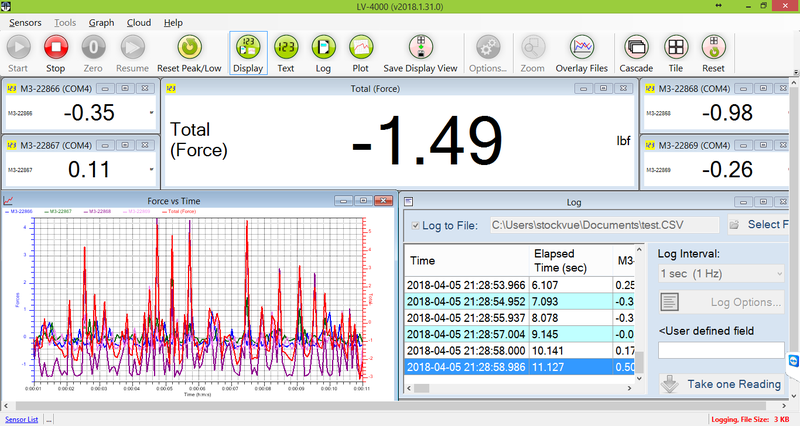 This software does everything that the LV-1000 software does but allows a user to display, log and plot data from up to four connected digital load cells or digital weight sensors. While LoadVUE works exclusively with Load, Force or Weight Sensors, SensorVUE supports a variety of sensors including load, force, weight, torque, pressure, level, temperature and displacement measurements. We are constantly adding new sensors to our product range and we plan to support those sensors in the future. In addition to all the features supported in LoadVUE Pro software, SensorVUE allows you to zoom into the plot to look at areas of interest closely, it allows you to place different parts of the software in different locations on the screen to create your preferred layout. 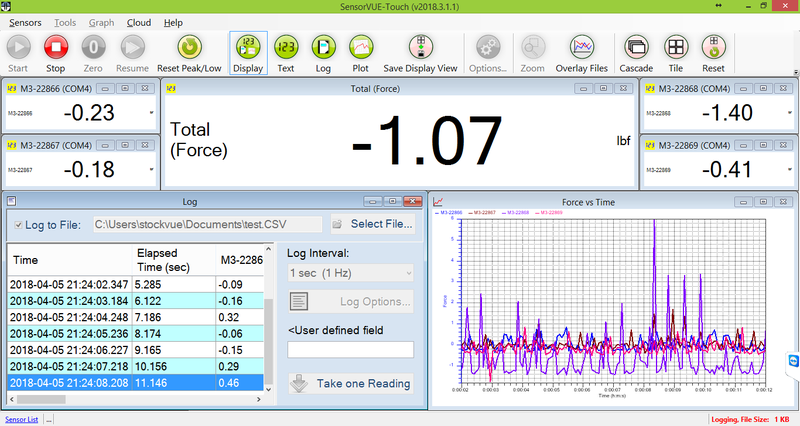 Users can also create derived values or virtual sensors from base sensor data (for example, measure force but divide that value by area to create a pressure sensor) and also create a variety of plots in a flexible way. For example. a user can display and log Force and displacement data and create a plot with Force and Displacement on the y-Axis and Time on the x-axis or create a plot of Force on y-axis and displacement on x-axis. While LoadVUE and SensorVUE allow a user to get digital information from a sensor, ControlVUE enables a user to control external devices. It enables a user to control a USB Relay with one, two or eight channels to turn on/off a variety of 110V/220V (2 A) devices or to control a USB Stepper Motor's angular position and speed. By coupling a rack and pinion gear system onto the motor, a user can also create a linear actuator. By using sensors and these simple control mechanisms a user can create automated solutions for applications such as bagging, filling and packaging. ControlVUE includes the full feature set of SensorVUE above. Most weighing applications are static or quasi-static in nature and don't require more than ten to twenty readings per second. 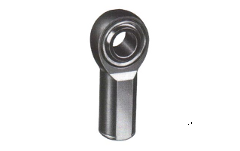 But some applications such as hammer test or impact force measurement or dynamic force measurements need much higher data rates to capture events that take place within just a few milliseconds. 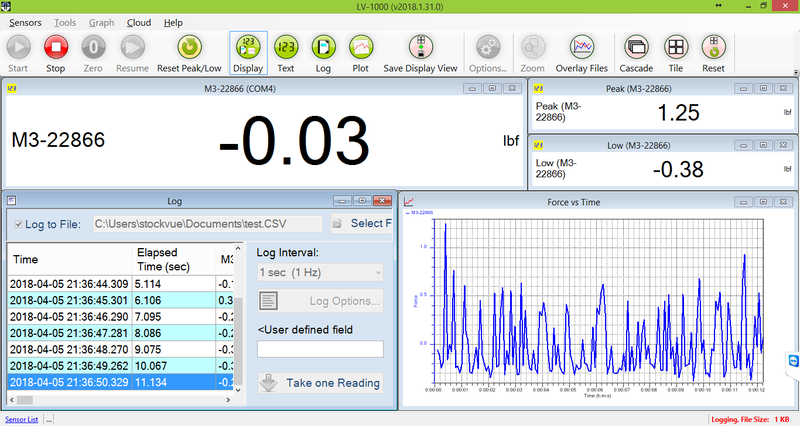 For applications such as these, we have developed the LV-1000HS-1K which works with our DI-1000U-1K USB Interface to provide a high-data rate capable solution for displaying, logging and plotting force/load/weight information. This software not only displays the actual force or weight measured by four connected load cells, it also displays the center of force or center of gravity between the four corners of a rectangle at the corners of which the load cells are placed. A user can also turn on a track CG feature that will show how the CG is changing with time. 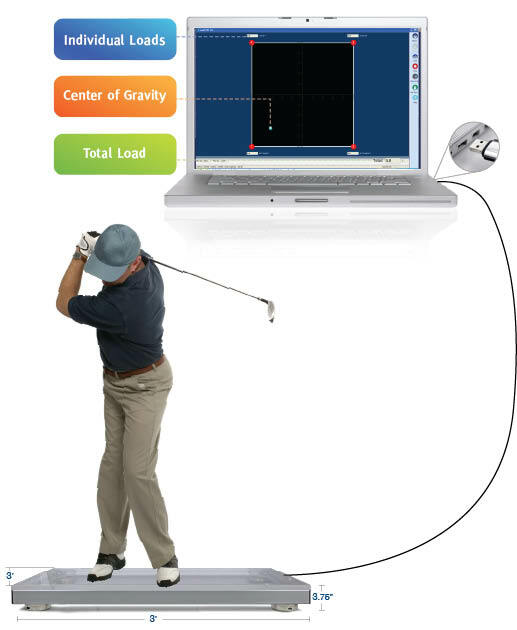 Users can use it display, log and plot center of gravity or use it to track CG of objects or the movement of things or people as in the case of a golf player swinging his club. 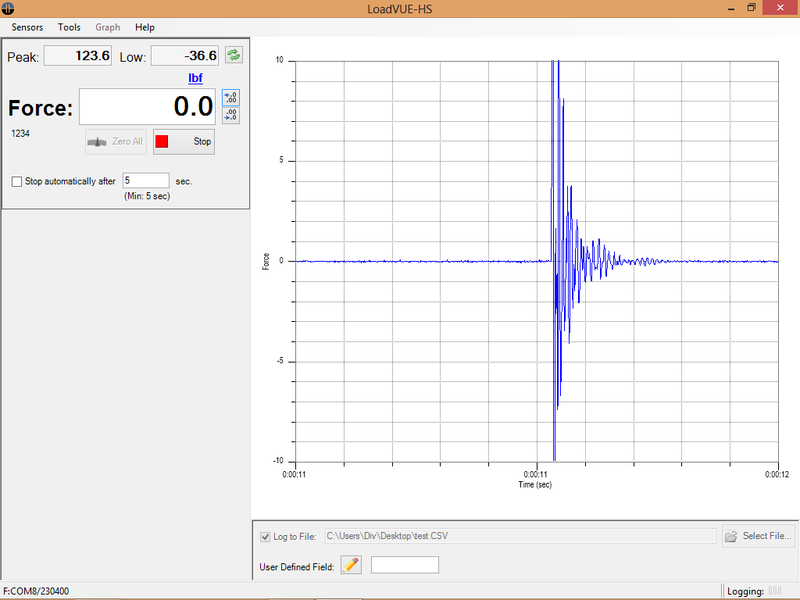 This customized version of LoadVUE Pro allows a user to not only display the measured punch force, but also count the number of punches, the frequency of punches thrown in a period of time etc. This allows a boxer or martial arts trainee or coach to monitor the performance of an athlete, track their improvement from week to week and help them to achieve peak performance. This software enables a user to place a number of pieces onto a scale and quickly count the number of pieces in the container. It also enables a user to store parts into a database with piece weight information that can be quickly accessed to calculate count information.